for anyone wishing to take up the work. Already many hundreds of ladies in all parts of the State are actively engaged in this work in their spare time, and their contribution in this respect, as a direct assistance to the war effort, is greatly appreciated by the Defence authorities. A sample of the work is now on, display in one of Pulsford's windows, and we are sure that many Windsor ladies will avail themselves of the opportunity now presented to them of doing some thing tangible in the war effort. A helicopter pilot will give a display of aerial tactics over Windsor Speedway this Sunday afternoon, August 14, before setting down on the track to pick up £800 in cheques for charity. The NSW Stock Car Owners and Drivers Association has donated the amounts of £400 each to the Spastic Centre, Mosman and the Royal Blind Society of New South Wales. The gift is to mark the official opening of a new and approved go-cart track at the speedway. The Association later intends to make a substantial donation to the Royal NSW Institute for Deaf and Blind Children. The copter will be piloted by Captain John Warne, of Helicopter Utilities Pty Ltd with Sydney artist Mr H Kenneth Cook as passenger. Both Captain Warne and the company have contributed their services as a donation to the charities. Mr Cook will receive the cheques from association officials on behalf of the charities named. The organisers were not being paid commission for their work, which was entirely voluntary, said Mr Cook. Members of the Austin Healey Sprite Club led by their team captain, Mr John Smith, will assemble on the track in full racing gear and beflagged cars, to welcome the arrival of the copter. More than 25,000 people are expected to attend the speedway to witness the final of the NSW Stock Car Championships. 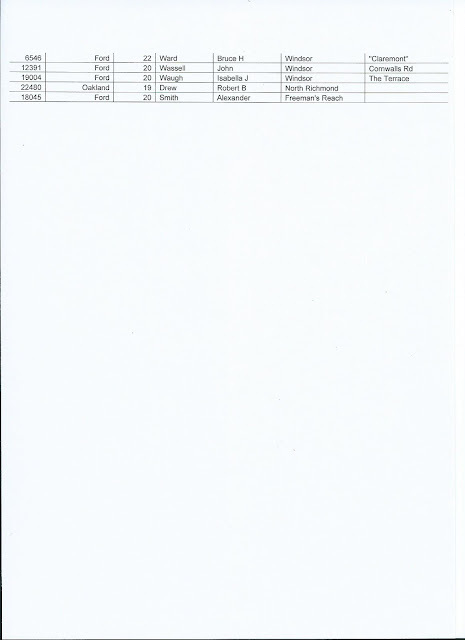 More than 50 stock cars have been entered for the championship event. 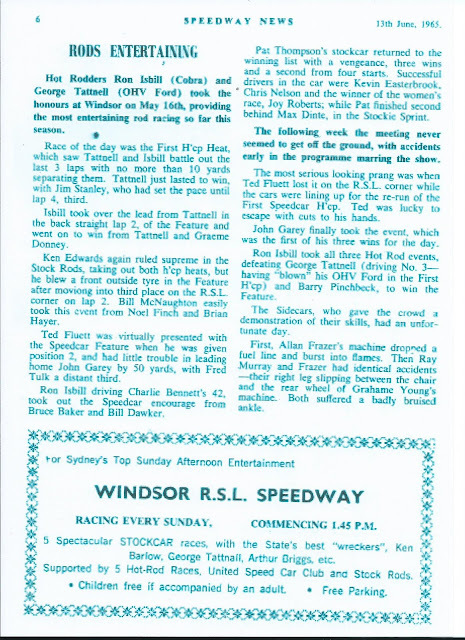 World stock car champion, Jim Thompson, will drive a Cadillac coupe and Les Smith, the Hawkesbury Valley champion, a Ford V8. Leading stock car drivers Allan Blyth of Bexley, Ralph Ellis of Sydney and midget car racing drivers Eric Morton and Fred Gardiner will compete in the event. A number of new "TQ" speedsters - highly powered Go Carts fitted with racing bodies - will make their appearance at the track for the first time. One of the several highlights of the program will be a mammoth parade around the Windsor circuit of cars taking part in the day's events. "Sydney Morning Herald 8th August 1960"
An RAAF Avro Anson of 6 Squadron crashed at Riverstone in April 1939. This wasn’t the only crash of a 6 Squadron Anson in 1939 – on the 18th of December another Anson crashed shortly after takeoff from the Richmond RAAF base. As with the April 1939 crash, here are the detailed reports on the crash and subsequent investigation from the “Windsor and Richmond Gazette”. Another sad Air Force fatality occurred in the early hours of Monday morning, when an Avro Anson bomber, which was taking off from the Richmond Aerodrome on a night reconnaissance flight to Point Cook, Victoria, crashed on the Richmond golf course, its crew of five, which included four officers, were killed. The bomber arrived at Richmond from Victoria on Friday. Flight Lieutenant Arthur Morehouse Watkins, 25, single, son of Dr AM Watkins of Roseville. Flight Lieutenant Hugh Bonham Horner, 27, married, of Point Cook, Victoria. Flying Officer Henry Parker Fitzgerald, 21 married of Tasmania. Flying Officer Malcolm Musgrave McInnes, 21, single, of Melbourne. Leading Aircraftsman Leonard J King, 23, single of Brisbane. With the five men on board the plane took off from the Aerodrome shortly before 1.30 am, and as it disappeared in the darkness the engines appeared to be running well. Another aircraft took off a few minutes later, but the ground staff at the aerodrome heard a roar and then a crash in the direction taken by the first plane, and when many ran to the spot they found the bomber smashed to pieces on the Richmond golf course. Every member of the crew was dead and some had been thrown for a considerable distance. Pieces of the plane were scattered over a wide area, parts being wrapped around the posts of a fence, while one engine had ploughed a deep hole in the ground. An examination revealed that both engines were at full throttle, but the plane was so badly wrecked that nothing could be readily seen to give a clue to the cause of the crash. With the aid of torches and flares the ambulance staff removed the bodies of the unfortunate men to the aerodrome, and later the remains of the aircraft were collected. The funeral took place on Tuesday, a service being conducted at Kinsela Parlors, Darlinghurst, by the Rev RGB Ashcroft, of Richmond, the Air Force chaplain. In the course of his address, the Rev Ashcroft said that these young men had given their lives for King and Country. “The loss of these valuable lives,” he added “is part of the great price we are paying in this struggle for liberty and freedom. Every day similar valuable lives are being sacrificed in the fight to overthrow force and aggression as a means of settling international affairs. How inexpressively sad it is when young men in the full vigor of their youth and struck down”. A verdict of accidental death through the crashing of the plane of which they were the crew, but as to what caused the accident the evidence adduced did not enable him to say, was recorded by the Hawkesbury District Coroner (Mr HS Johnson, JP) at the Windsor Court House on Thursday of last week, after hearing lengthy evidence as to the circumstances, surrounding the tragic death of five members of the RAAF in the early hours of the morning of December 18, when an Avro Anson bomber crashed on the Richmond Golf Links a few minutes after taking off from the Richmond Air Station on a navigational flight to Point Cook. A feature of the inquiry – at which the Coroner commented on the “injudicious” action of an Air Force official in forwarding to two relatives of the deceased men telegrams stating that attendance at the inquest was not obligatory on their part – was the examination of Air Force witnesses by relatives of three of the deceased, who also gave evidence of conversations with members of the crew regarding the functioning of the plane concerned, and emphasized that their examination of witnesses was not prompted by any vindictive spirit, but by an anxiety to ensure that all precautions were being observed to safeguard the lives of the flying personnel. 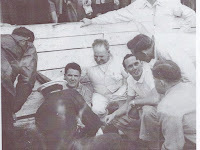 In connection with certain references made at the proceedings, the Coroner stated that there was no evidence to indicate that members of the crew had any liquor prior to the flight. The deceased men were Flight-Lieutenant Arthur Moorehouse Watkins, Flight-Lieutenant Hugh Horner, Flying Officers Henry Peter Fitzgerald and Malcolm Musgrave McInnes, and Leading Aircraftsman Leonard John King. Dr Arthur Moorehouse Watkins, Roseville stated that the deceased Flight-Lieutenant Watkins was his son. Deceased was 24 years of age, was single, and perfectly healthy. He left no property or will, and his life was not insured. When witness last saw him alive he was in good health and spirits. In reply to Detective-Sergeant Flint, witness said he last saw his son at the home of friends at Killara, when he was in the company of Flight-Lieutenant Horner, both refusing any alcoholic refreshment when it was offered to them by their hosts. This was on the evening of December 17, immediately prior to their departure for Richmond Air Station. In reply to a question by the Coroner, witness said he had received a telegram from the Adjutant at Point Cook, stating that it was not necessary for witness to attend this inquest. The Coroner: Well, I can only say that was very injudicious on the part of the sender of the telegram. I trust it will not occur again. The Coroner alone is the person to say whether the attendance of a witness is necessary or otherwise. Asked if he wished to make any additional statement, Dr Watkins replied in the affirmative, adding “My chief reason for being here today, Your Worship, is that I want to clear my son’s memory of a scurrilous attack made on it by a not over-punctilious daily paper.” He went on to give a detailed statement of his son’s movements from his arrival home after completing the flight from Point Cook to Richmond, to his departure at 10.15 pm for Richmond Air Station preparatory to making the return flight. During that period deceased spent all his time between his parents’ home and that of his fiancé, who resided a short distance away. When he called at a friend’s home at Killara to say farewell to his parents, who were visiting there for the evening, his host offered him and Flight-Lieutenant Horner a drink, and they asked for ginger ale, which they drank. Witness’ son had not attended any wedding party, and had not consumed any alcoholic liquor during his stay. At this stage Dr Watkins said he had a statement written by Mrs Watkins concerning a conversation with her son when she met him on his arrival at Richmond from Point Cook. After a short consideration, the Coroner remarked that he did not think this statement would be material to the matter he had to decide, whereupon there was a concerted chorus of protest from other relatives of the deceased man present , one remarking “But it is material, Your Worship!”. The Coroner, after pointing out that this was a matter for him to decide, and that he would not tolerate any more interruptions of this kind, finally decided to have the statement tendered as an exhibit, and it was thereupon read. In the course of the statement, Mrs Watkins had written that in conversation with her son on his arrival she had asked him whether he had a good trip, and he had replied that they had been having a good deal of trouble, owing to the fact that the number of mechanics in his squadron had been considerably reduced, having been cut down in number from 15 to 6. Flight-Lieutenant Hartnell, who was present, remarked that they had been having the same trouble in his squadron, and that the men were “working night and day, and are worn out”. When he asked what the trouble was, witness continued, deceased said “the old ‘maggie’ gave us a lot of trouble coming over. It kept cutting out and spluttering, and I want the job properly fixed up”. At 6.5 pm on the same day, deceased again telephoned the Air Station, after which he informed witness that “the job’s fixed up”. At 6.30 pm he telephoned Mascot Aerodrome to get a final weather check, and then remarked to witness that the ceiling was perfectly clear, and that they would be taking off at about 1.00 am on the following morning. At 9.15 pm Flight-Lieutenant called at witness home to make the trip to Richmond with Flight-Lieutenant Watkins, and before they left witness offered them a drink “for the road”, as he would not be seeing them again until Christmas, but they both refused, later having a ginger ale each. In reply to a question by the Coroner, witness said that definitely the two officers he had mentioned did not attend a wedding party, adding that he and his daughter both felt very keenly the injustice of the allegations of the paper he had mentioned. They had been asked by the Air Force authorities after the accident not to make any statements to the press, and they had agreed to this request, which had been honored to the letter. Meanwhile the “Daily Telegraph” had been allowed to publish certain statements without censorship, and the headline over the article had been “atrocious”. In reply to Flight-Lieutenant Macfarlan, witness said he did not know the identity of the person to whom Flight-Lieutenant Watkins was speaking on the telephone. He did not suggest that the Air Force authorities had issued the statement which had appeared in the paper mentioned, nor did he entirely disbelieve that this was so. He would merely say that he thought the article was published with the knowledge of the Air Force. At this juncture Flight-Lieutenant said he wished to explain to the Court that the National Security regulations, under which the censorship as concerned to the Air Force was imposed, related to the movements of aircraft, etc, and had no relationship to the private movements of any member of the Air Force, which was the subject of the article mentioned. In any case, were such an article to come within the censorship regulations, it would be a matter for the Chief Censor, and the RAAF was not associated with it in any way. The Coroner replied that he accepted this explanation. Harold Gordon Horner, general manager of Station 2GB and the Macquarie Broadcasting Network, stated that Flight-Lieutenant Horner was his son, whom he had last seen alive on December 16, when he appeared to be quite fit and in good spirits. He was a married man, and had left no property, but had had three life insurance policies. Witness only wished to add that any suggestion that his son had been drinking on the subject weekend, or had attended any wedding party, was absolutely incorrect. Dr Frederick Ismay Woolten stated that he was attached to the RAAF Station at Richmond, and he had been the duty medical officer on the morning of December 18. At 1.20 am on that date he was awakened and informed that a crash had occurred at the western end of the aerodrome, on the golf links, and he immediately proceeded to the scene with the ambulance. On arrival he examined the five members of the crew of the plane which had crashed, and found that each was dead, having obviously been killed instantly. He thereupon immediately proceeded to establish identification of the bodies. Going on to give detailed evidence as to the injuries sustained by the five deceased, the doctor added that in his opinion death was due in each case to a fractured skull and cerebral trauma. The bodies were removed to the aerodrome, where witness subsequently gave a verbal report, and later a detailed report, to the Coroner on the nature of the injuries. In reply to Detective-Sergeant Flint, witness stated that in his examination of the bodies he detected no trace of alcohol whatsoever. Squadron Leader Harold Burston Seekamp, attached tp the RAAF Station, Richmond, stated that he was duty staff officer over the subject weekend, and at 12.45 am on December 18 Flight-Lieutenant Watkins, as officer in charge of the flight, came to him to report prior to taking off on a return navigational flight to Point Cook. Witness asked him if he was quite satisfied with the engines (which, witness had been informed, had been serviced during the preceeding day) and he replied that he was quite satisfied . They then consulted the weather reports, and witness, being satisfied that everything was in order, authorized the flight. He would say that Flight-Lieutenant Watkins was quite fit at the time. There was some cloud or mist at about 500 feet, but horizontal visibility was good. He watched the two machines making the flight take off, and a few minutes after he lost sight of the first one he saw a red light traveling towards the ground at an angle of about 30 degrees to the horizontal. He then heard a thud, and the cessation of the sound of the engines of one of the machines. He immediately issued the necessary orders for the despatch of the ambulance, crash squad, etc to the site of the crash, and when he arrived the ambulance, doctor and police were already there. Flight-Lieutenant Watkins, up to November 16, had had 840 hours as a pilot, including 400 hours on Anson aircraft. Witness produced an order that Flight-Lieutenant Watkins was to be O.C Flight, and that the flight was to be made at his discretion . For a time this officer had been chief instructor of the navigational course at the flying school at Point Cook. To Detective-Sergeant Flint, witness said he did not know of anything which might indicate the cause of the crash. There were many possibilities, but he could not suggest any particular theory. Flight-Lieutenant Watkins was a highly-competent officer – particularly in navigation, in which he was a specialist. Flight-Lieutenant Horner had had a great deal of flying experience – probably more than had Flight-Lieutenant Watkins, who, as captain of the aircraft, was responsible for the disposition of the crew of the machine until it had returned to its base. Witness had no reason to suppose that the machine was not in serviceable condition, as defects reported had been fixed to Flight-Lieutenant Watkins’ satisfaction. Witness could not say who was piloting the machine when it took off. The others were capable pilots, and if he chose the captain of the aircraft could put one of the others in the pilots seat, as he was perfectly entitled to do. To the Coroner, witness said he could swear that Flight-Lieutenant Watkins was perfectly normal during their conversation. Witness had not seen any other members of the crew, but from what he knew of Flight-Lieutenant Watkins, he was confident that that officer would not have permitted any irregularities in the form of drinking before the flight. To Flight-Lieutenant McFarlan, witness said that it was the responsibility of the crew of any visiting aircraft to see that any defects in their machine were rectified, and it was the responsibility of the duty pilot on the aerodrome visited to ensure that such reasonable assistance as to the flight required should be provided. The daily inspection was the responsibility of the pilot, in charge of the machine concerned. To Mr Horner, witness said that none of the deceased was a qualified fitter or rigger, but a pilot was capable of doing routine inspection, which was not a very technical job. Expert examination was provided for at 10 hours, 20 hours, 40 hours and 120 hours flying intervals, the larger machines coming into the later inspection period. To Mr Norman King (a brother of one of the deceased), witness said a record of the hours which the engine of the subject machine had functioned was not available. It would be necessary to obtain this from Point Cook, and a request for the record had been forwarded. It was to have arrived that morning, in time for the inquiry, but as yet it had not been received. Flying Officer Blake Richmond Pelley, attached to the RAAF Station, Richmond, stated that he was duty pilot at the Air Station on the subject weekend. On December 16 Flight-Lieutenant Watkins informed him that he (Watkins) had brought two Ansons over from Point Cook, and that they required refueling and examination of the starboard engine of each machine. Witness accordingly had them refueled, and two fitters examined the starboard engines under his supervision. Witness then personally tried the running of the engines. Previously they had been running roughly, but after the overhaul they were running “very well indeed”. The engines were overhauled by Leading Aircraftsmen Pollard and Leading Aircraftsmen Sample, after which witness tested each of the engines concerned by starting it, warming it up, and testing it on each magneto. After the machines had taken off on the subject morning, and Squadron Leader Seekamp informed witness of the crash and issued his orders, witness took all prescribed precautions, including the dispatch of the fire tender, ambulance, etc to the scene. To Detective-Sergeant Flint, witness said that when he stepped into the subject plane to give the crew their last instructions, before taking off, Flight-Lieutenant Watkins was in the pilot’s seat, and it was extremely probable that he was the pilot when the machine took off. Before leaving the witness box, Flying Officer Pelley said that when the police had taken his original statement and asked him his qualifications entitling him to test the engines, he had replied that he thought it was sufficient to say that he was qualified to do so. Now, however, he wished to add that he was so qualified because of his training as a pilot of the RAAF and because he was the holder of an engineering degree from Cambridge University. The next witness called was Leading Aircraftsman Pollard, but it was explained that he had since been transferred to Melbourne, and Detective-Sergeant Flint tendered a statement he had obtained from the witness. Mr Allen thereupon asked whether, in view of the importance of this inquiry, the Court might be informed why this witness was transferred before the inquiry took place, and Flight-Lieutenant McFarlan explained that Pollard’s flight had been transferred to Melbourne. He had been asked to attend, but apparently had not done so. However the speaker would point out that, of the men who had serviced the subject machine, only one had been ordered by the Coroner to attend. Mr Horner remarked that, as evidence had been given regarding certain telephone conversations, and either of the mechanics might have been the person spoken to on the telephone, it was “a great pity” that they were not present. The Coroner replied that Pollard’s statement was very brief, and threw no light on this matter, and, unfortunately, no names had been obtained in connection with the conversations recorded. To a remark by Mr Allen that presumably there would be some record of such telephone conversations, Flight-Lieutenant MacFarlan replied that it was obviously impracticable to record every order which might be given at the Air Station. At this stage Flying Officer Pelley asked permission to make a further statement to assist the inquiry, and, when this was granted, stated that, as he was the duty pilot at the relevant time, any telephoned orders or requests regarding servicing of machines would, directly or indirectly, come to him. No telephone messages or calls from the late Flight-Lieutenant Watkins came to witness on that weekend, and any such would be addressed on that weekend to the duty staff office (Squadron Leader Seekamp) or witness. Asked by Mr King the nature of the trouble found in the starboard engine, witness replied that careful examination had disclosed that the spark plugs were faulty, and these were removed and replaced with tested plugs. When this was done, the maximum revolutions of the engine were entirely normal. To Mr Horner, witness said that there was no possibility of his having made a mistake as to which engine Flight-Lieutenant Watkins had asked him to service. The request was not made in any written order, but witness immediately wrote it down on a scrap of paper. He had not kept this piece of paper after the servicing had been carried out. At this stage Flight-Lieutenant MacFarlan took exception to the expression “disgusting” which he had just overhead in the body of the Court, and Mr Allen, in informing the Coroner that he had used the expression, said that he would withdraw the remark, but it had been actuated by the thought that here was an instance where five lives were at stake, and yet no record of any engine defects had been kept, or any record to show whether the servicing, in fact, had actually been carried out, apart from a verbal statement made to this inquiry. Flying Officer Pelley immediately took exception to the remark, whereupon the Coroner directed attention to this witness’ detailed statement of the work which had been carried out, and Flying Officer Pelley added, that if desired, he could have attend to give evidence, the duty pilot from whom he took over, and the Flying Officer who assisted in supervising the work. Mr Allen asked if any evidence could be obtained to indicate which wing of the machine hit the ground first when it crashed, and Squadron Leader Seekamp handed him photographs of the wreckage, which, he said were the only indications which could be given in that respect. Flying Officer William Thomas Morton Bolton, attached to the RAAF Station, Richmond, gave evidence of having at about 1.20 am on December 18, been present on the tarmac at the aerodrome when two Avro ‘planes took off. The first one circled the aerodrome, with its engines functioning normally, as the second one took off, but shortly after that the first machine had crossed the aerodrome heading in a south-westerly direction, witness heard a thud, aand was one of a search party which subsequently made an unsuccessful search for the crashed machine. Flying officer Russell Edwin Bell, attached to the RAAF Station, Richmond, stated that he was present when the two machines took off, the second following the first about 3 minutes interval and just then witness saw the tail light of the first machine appear out of the cloud above the aerodrome, and the navigation lights of the machine showed it to be gliding towards the ground at an angle of about 45 degrees. The lights disappeared, and a few moments later witness heard a dull thus. He was a member of the search party dispatched from the station to find the wreckage. The night was clear, so far as horizontal visibility from the ground to about 600 feet. At this stage the inquiry adjourned for lunch, and on its resumption Leading Aircraftsman Joseph Frederick Walmsley, attached to the RAAF Station, Richmond, stated that on the night in question he was awakened at his home in Windsor Street, Richmond, by the sound of an Anson flying over, and almost immediately afterwards he heard a thud, and the cutting-off of the engines of the machine. Adding that he, on hearing the crash siren at the aerodrome, immediately seized a torch and went to look for the wreckage, witness proceeded to give detailed evidence as to the disposition of the bodies and the wreckage when he arrived on the scene. Each member of the crew was quite dead when he arrived, and he subsequently assisted with the identification of the bodies. As regards the engines of the machine, witness added it was his opinion and he was competent to give an opinion – that they were running quite normally when the machine passed over his home. The sound of the engines did not cut out until the bump occurred. The crash was only 200 or 300 yards from witness’ home. As regards the position of the plane when it struck, he would add that when it passed over his home it banked to port, and the port wing appeared to dip low a few seconds before witness heard the thud. After daylight witness made a minute examination of the scene, and discovered certain identification marks which convinced him that the port wing had hit the ground first. In reply to the Coroner, witness said he could venture no opinion to what caused the port wing to strike the ground first. To Detective-Sergeant Flint, witness said that when he heard the plane he went straight to his bedroom window and looked out. He thought the machine was flying at slightly more than normal speed. It was turning in a normal bank, and there was nothing to suggest that it was going to crash. To Mr Horner, witness said he had made no mention, in the statement he had given to police, of the functioning of the engines, as he considered this was a matter for the mechanics concerned to make any comment when they gave their statements. He had only mentioned the subject at this strange to cheer up a point which had been raised at this inquiry. Although he had a theory on the matter, he could not suggest why the plane had lost elevation. Robert Turner Rankin, locomotive cleaner, Richmond, stated that he was at the Richmond locomotive shed on the subject morning when he heard a plane take off. The engines cut out several hundred feet above the ground, and then began to roar again. This happened twice, then the engines began running normally. Witness then heard another machine coming towards him only about 100 feet above the ground. This appeared to be turning, and it lost elevation and suddenly crashed. It was a very dark night, with no moon. Witness immediately ran in the direction of the crash, notifying Constable Hunt on the way, and, guided by the smell of petrol, they eventually reached the scene of the wreckage, among which at different places, five bodies were lying. To Flight-Lieutenant MacFarlan, witness said he was quite sure that the second aircraft to leave the ground was the one which crashed. The engines of this ‘plane were functioning normally from the time it left the ground until it crashed, and there was no cutting-out whatever. Constable Hunt, Richmond, gave evidence corroborating that of the previous witness as to the finding of the wreckage, and went on to describe the positions of the bodies and the steps taken to identify them. The wreckage was strewn over a distance of 130 yards, and at one spot was lying around over a radius of 35 yards. Norman Wilfred King, ground engineer, Randwick, stated that he was employed by Qantas as a aero engineer. The deceased leading Aircraftsman King was his brother, whom he had last seen alive at witness’ home on 8 pm on December 12, when he left for the return flight to Point Cook. During the whole of the time the crew was at Sydney, witness’ brother was at home. To the Coroner, witness said that his brother was not at any party during his visit, and would have an alcoholic drink only at very rare intervals so rare, in fact, that to all intents and purposes he might be called a teetotaller. At this stage witness handed to the Coroner a telegram he had received requesting his attendance at the inquest, and, after reading this aloud, the Coroner repeated his earlier remarks on this subject. To Mr Horner, witness said that he was licensed by the Civil Aviation Department in 1934 as a ground engineer, and he had been in engineering occupations since 1931. It was the practice when he was employed for Qantas pilots or co-pilots to make written reports of faults at the end of each flight and as these were rectified the fact was noted in the log books and signed by the engineer responsible. Under no circumstances would verbal reports be accepted. Witness experience had shown that mistakes could be made as to starboard and port engines, and this mistake could even be made in a written report. During his visit home, witness’ brother had mentioned that one of the engines of his machine had been “very rough” on the trip from Point Cook, and he hoped that this would be rectified before the return trip began. It could happen that one engine might be reported as faulty and the ground crew, finding that the other one as moderately faulty, and being under the impression that it was the one reported, might survive it without testing the one actually reported. At this stage Mr Horner pointed out that it had not been said in evidence that both engines had been checked, to which the Coroner replied that he had before him ample evidence that both engines were functioning normally when the plane took off. To Flight-Lieutenant McFarlan, witness said that if both engines were treated by running, a defect should be noticed by a qualified person listening expressly for that purpose, such as a qualified pilot of the RAAF. Flying Officer Pelley recalled, said, in reply to the Coroner, that he had only received verbal instructions regarding the servicing of the plane, whereas any such request by a pilot should be made in writing on the prescribed form known as “E.77”, in accordance with the regulations. It was the duty of every pilot to complete certain entries at the conclusion of each flight, and these covered the satisfactory running or otherwise of the machine concerned. Witness did not receive any such report on the subject occasion. To Flight-Lieutenant McFarlan, witness said it was also the duty of a pilot of a visiting plane, or his deputed representative from the crew, to be present when any servicing of the machine was carried out. On the occasion in question no member of the crew was present when the work was carried out, and witness made out a full report of the circumstances and submitted this to the duty staff officer. He was present at the takeoff of the machine, and heard the engines testes in the normal way prior to the flight. After the testing of the engines, no member of the crew made nay complaint as to their running. To Mr King, witness said that he had not tested the port engine, as he had only been requested to service the starboard one. As a matter of fact, it was not his duty to test the engine at all, as he had not received the prescribed form, already referred to, instructing that this should be done, and it was the responsibility of the pilot that this should be submitted. In reply to Mr Horner, witness said that in his opinion there had been no carelessness on the part of the ground organization in this matter. He did not draw the attention of Flight-Lieutenant Watkins to the irregularity of the manner in which he made the request for the engine overhaul, as the latter appeared to be in a hurry to get away to Sydney, and witness did not know that he would not be seeing him again until just before the return flight. Witness had heard no complaints as to the difficulty of keeping up the nose of Ansons in flight. In reply to Mr Horner, witness said that it would have been competent for Flight-Lieutenant Watkins to have deputed a member of his crew to supervise the servicing. Witness noticed one member of the crew at the ‘plane on December 17 but when he went to him and explained the circumstances under which the servicing was carried out, he received the reply “That’s Flight-Lieutenant Watkin’s pigeon” (At this stage witness said he wished to emphasise how distasteful it was for him to give evidence of this nature or in any way draw attention to any breach of duty committed by any one of the deceased men). Squadron Leader Seekamp, recalled, gave evidence of having received the report submitted by the previous witness, and of having submitted it, as was his duty, to the Station Commander on the following day. When he saw Flight-Lieutenant Watkins, prior to the takeoff, he mildly reproved him in connection with the lack of supervision of the servicing, and asked him if he was satisfied with this work, to which he received an affirmative reply. To Mr Allen, witness said that Flight-Lieutenant Watkins “took the reproof in a great manner”, and said he had left two officers on the station, but did not say whether he had specifically instructed them to supervise the work. Mr King asked if it might be possible to obtain the history of the engines of the subject ‘plane, and Flight-Lieutenant McFarlan said it would be necessary to obtain this from Point Cook, but if it was desired by the Coroner it would be secured, as the Air Force Authorities were desirious of assisting the inquiry in any way. There followed a discussion on the desirability or otherwise of an adjournment of the proceedings in order to permit of this information being obtained, in the course of which the Coroner remarked that he had a good deal of evidence before him to indicate that the engines were running perfectly, but he did not wish anything to be overlooked in the inquiry and would be prepared to arrange an adjournment if the parties interested desired this. All other parties, with the exception of Mr King, then intimated that they did not desire an adjournment, and the Coroner finally ruled that he had sufficient evidence before him to enable him to record his verdict. "Billy Stutt and the Richmond Flyboys" by Neville F. Hayes. This year will mark the centenary of a 1916 Richmond event that was hailed, at the time, as: "historically as memorable as the date of initiation of railway construction in NSW, away back in the early 1850s." So what was this momentous happening? - It was the foundation of the 'NSW State Aviation School' at Richmond, in the middle of the First World War. While this organisation has largely been forgotten today, its centenary is indeed worth commemorating. This was the key moment when large amounts of Government funding began to be poured into the site of the future Richmond RAAF Base, which is today so important to the Hawkesbury economy and to the national operations of the RAAF. It was also an opportunity for local boys to acquire undreamed-of skills, which would take them around the world in the wonderful new aviation industry. On the 28th of August 1916, four hundred guests were invited to a lavish reception inside the State Aviation School's large, newly-constructed hangar on Richmond's "Ham Common" (right in the heart of today's RAAF Base). The guests were there to celebrate the official opening of the School and to welcome the first intake of student-pilots. It was indeed a big event. The Premier, Mr. Holman, had taken a personal interest in "kick-starting" the aviation industry in NSW. The State Governor and many other VIPs were also present. The months of preparations leading up to the School's opening had been well-covered by the (then) Richmond and Windsor Gazette. However, in stark contrast, the Gazette gave the opening celebrations a rather sour review. 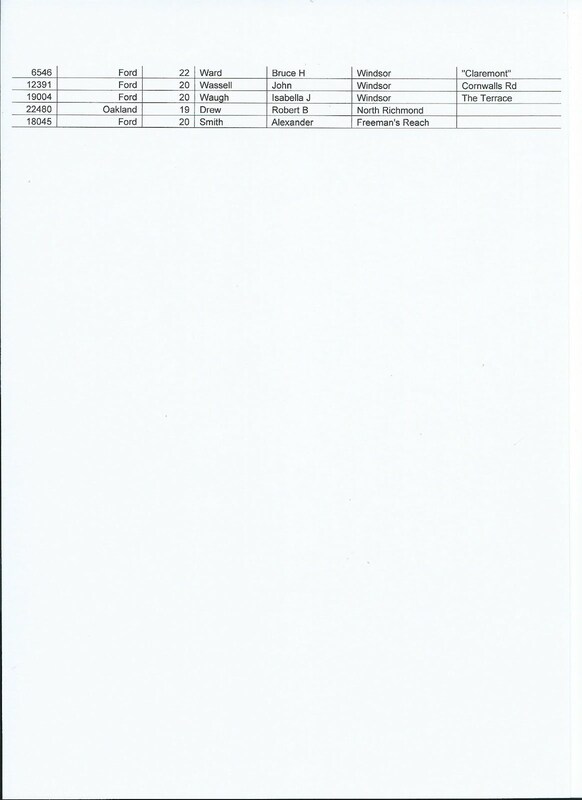 - It turns out that the the Government invitation-list for the nosh-up had not included the Gazette Editor! We now have access to such delightful historical insights thanks to the publication of a marvelously comprehensive book on the turbulent three-year tenure of the State Aviation School at Richmond, "Billy Stutt and the Richmond Flyboys" by Neville F. Hayes. There are many other fascinating quotes from the Gazette in this book, plus a cornucopia of other research from official sources and the family collections of the various "Flyboys". Premier Holman had also been miffed by the fact that all of the Commonwealth's flight-training expenditure was focussed on Point Cook in Victoria. 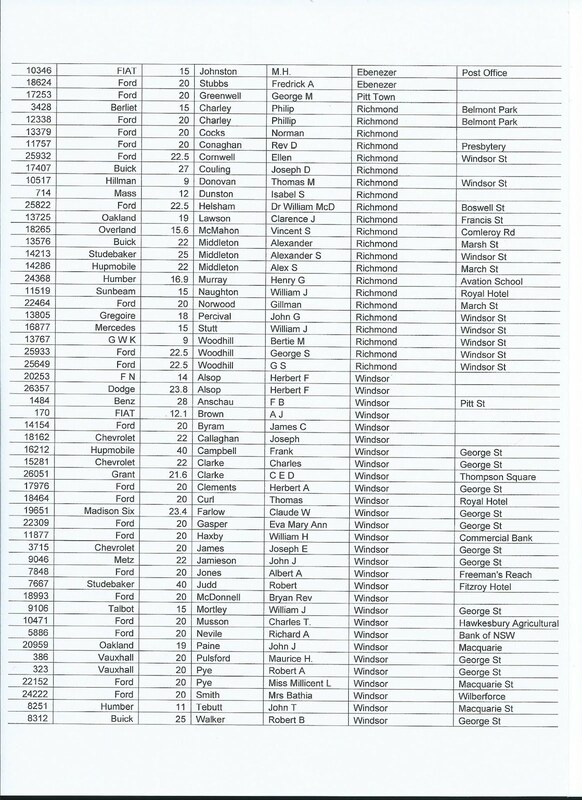 Even worse, there was suspicion that NSW applicants for the Australian Flying Corps were not being accepted in the glorious numbers that the Premier would have anticipated! (In fact, Point Cook was beset my many intractable problems with obtaining training aeroplanes, so its throughput of graduates from all states was tiny.) The Richmond Aviation School was very obviously a 'Pet Project' for the Premier. Equally obviously it caused great annoyance to Australian Military Authorities, and the Federal Government, in its clear attempt to barge-in on the centralised war-training efforts of the Commonwealth. 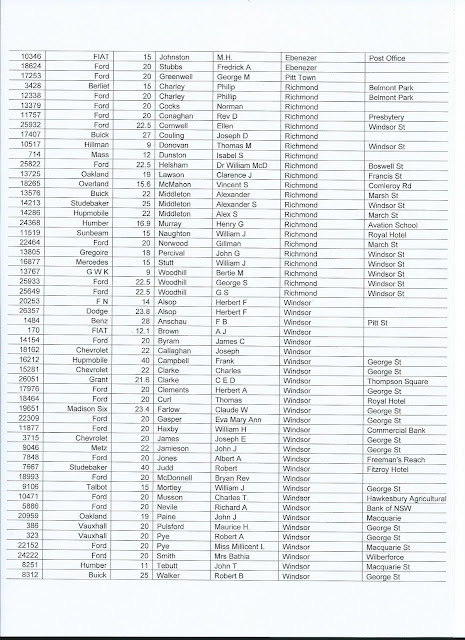 In total, 58 flying certificates were issued by the Richmond School before the cessation of hostilities and quite a few of the earliest graduates made it into action in France and Palestine. Nigel Love, a Kurrajong boy who graduated from the 1st Course, piloted RE8 two-seater aircraft over the Western Front, with the 3rd Squadron of the Australian Flying Corps. His biggest impact on the war was made in the missions where he used Morse Code to guide Allied gunfire in destroying key targets, such as German artillery batteries. Flying low and dodging bullets during major battles, Nigel also carefully mapped the progress of the infantry and dropped his reports directly at General Monash's headquarters. After the Armistice, Nigel returned to Australia with big plans to establish the country's first commercial aeroplane manufacturing company. This he did, although Government interference created many headwinds for him. Nigel's factory was at a little airfield near Sydney that he had founded - called "Mascot"! Monday 4th November 1918. Went up at 6am with Lt. McGilvery. Got to the line in about 15 minutes. Great sight with all the guns firing. Big barrage going up, hundreds of guns taking part. Just about daylight, a heavy ground-mist lit up by gun-flashes looked magnificent. Could even notice the mist cut aside by the big shells. We were flying at 2,200 feet. Let go our bombs, the smoke helping to screen the infantry advance. The opening stages of this 'stunt' was a sight from the air. One never to be forgotten. Sadly, seven of the graduates were killed in action in the war, or in European training accidents. Remarkably for the time though, the Richmond School actually had no fatal crashes during any of its six courses. This is a testament to the skill and personality of its Chief Instructor, Billy Stutt (a highly-experienced aviator who had been recruited from a test-pilot position in England) and the provision of a modern and reliable training aircraft, the Curtis 'Jenny'. The book gives much interesting detail on the 'Jenny' and also on Stutt's life and his mysterious loss in a crash in North-Eastern Tasmania in 1920 whilst he was flying a search-and rescue mission. His body has never been found. Review by James Oglethorpe, 3 Squadron RAAF Association. This book is available from the publisher Pacific Downunder for $34.50, including postage within Australia. 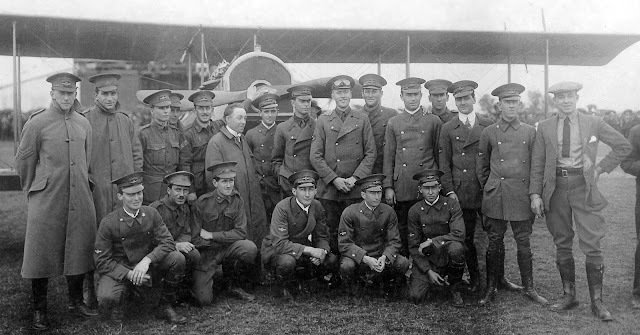 Line-up of student pilots from the First Course of Richmond State Aviation School, during the Opening Day celebrations, 28 August 1916. Nigel Love, who flew 200 hours over the front with the 3rd Squadron of the Australian Flying Corps, is at the far left of the back row. The 24 student-pilots in the 1st Course were selected from amongst 413 applicants. The roof of the Richmond hangar, bedecked with flags, can be seen behind the Curtis 'Jenny' two-seat training aircraft. Photo credit: www.3squadron.org.au, Nigel Love Collection. 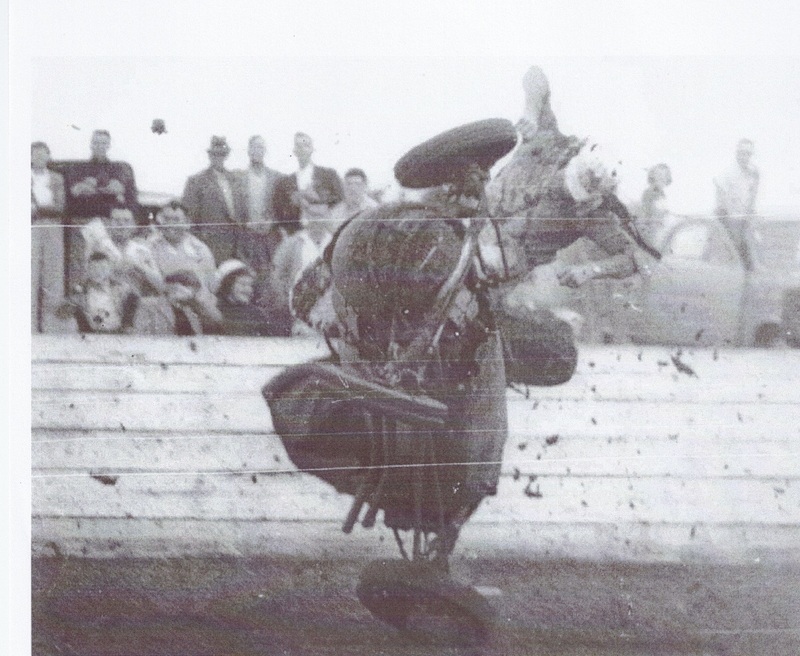 "Like any speedway track, the Windsor RSL Speedway had its fair share of spectacular accidents, and one of the most spectacular involved speedcar driver Merv Ward back in 1956. A very spectacular accident! Merv Ward’s head is just visible behind the ambulance officer in the final photo, and he is probably wondering how he is still in one piece and conscious. His injuries were a laceration to his lower right leg and ankle, and shock. He was taken to the Hawkesbury District Hospital and after observation, was allowed to leave. 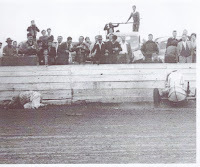 Back in the 1950’s, speedcars did not have the range of safety measures that exist in modern cars. 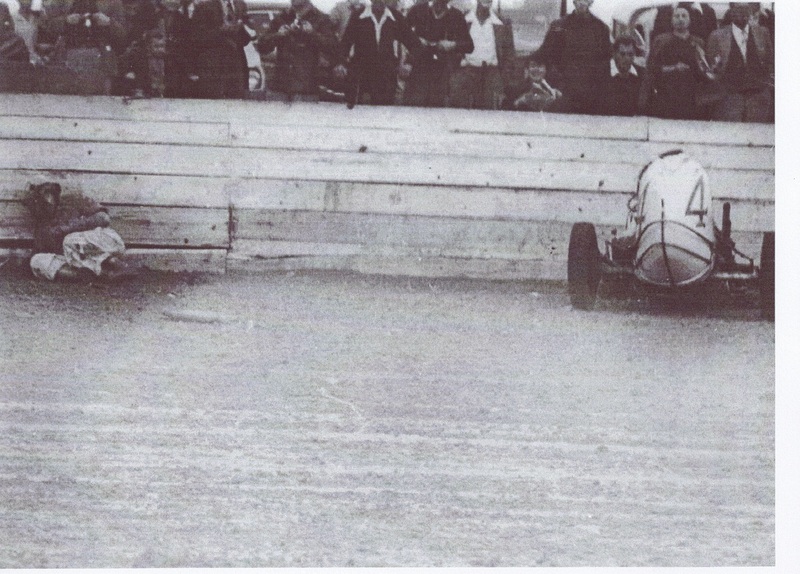 The only restraint that the drivers used was a lap belt which was fitted across their abdomen. Most of these belts were ex-military equipment, and they were not always reliable, as the Ward accident showed. 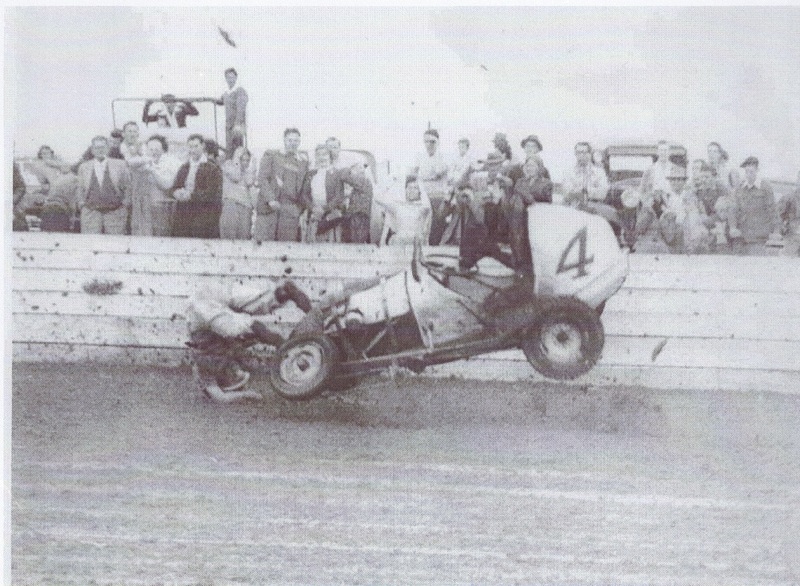 It wasn’t until the early 1960’s that shoulder harnesses were fitted, and in the early 1970’s full roll-cages were fitted to cars. 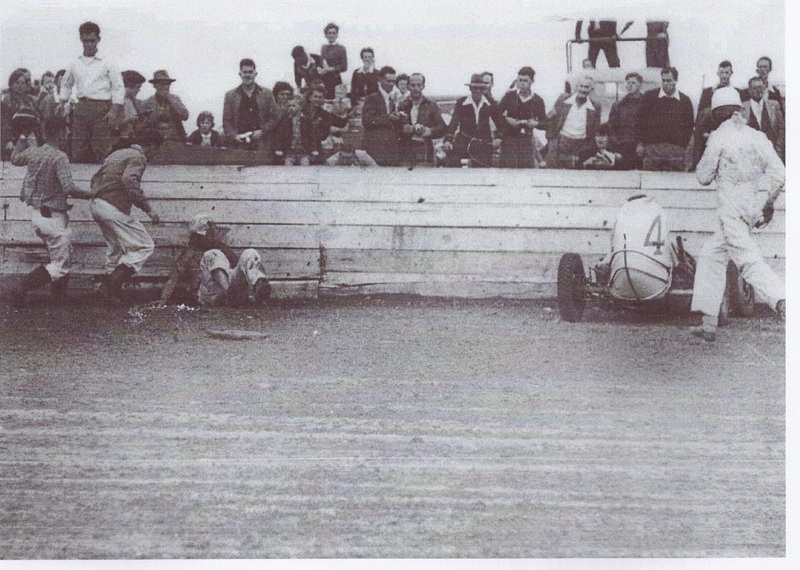 Not all accidents at the Windsor RSL Speedway in 1956 had such a happy ending. 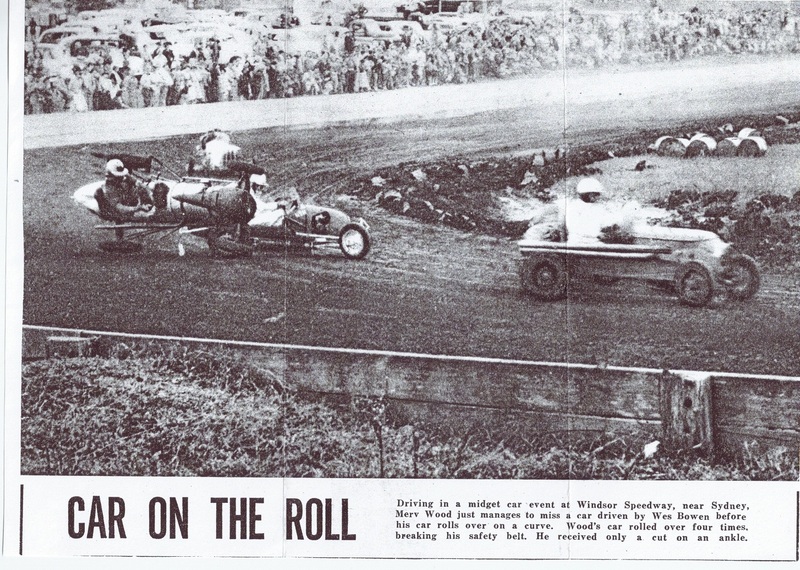 On the 12th of August, Charlie Cam was competing in a speedcar race when his car rolled-over in a race. Like Ward, Cam’s safety belt broke, and he was thrown onto the track, suffering two depressed fractures of the skull, and died shortly afterwards – the first of two fatalities at the speedway between 1949 and 1968."